of the farmers from Ukkalgaon village of Shrirampur block. By analyzing the problem and reasons behind it, the KVK made an effort by providing a suitable solution of rakshak traps for effective management of fruit flies in water melon. Rakshak traps are the pheromone traps which are useful for mass trapping of the male adults of fruit flies. 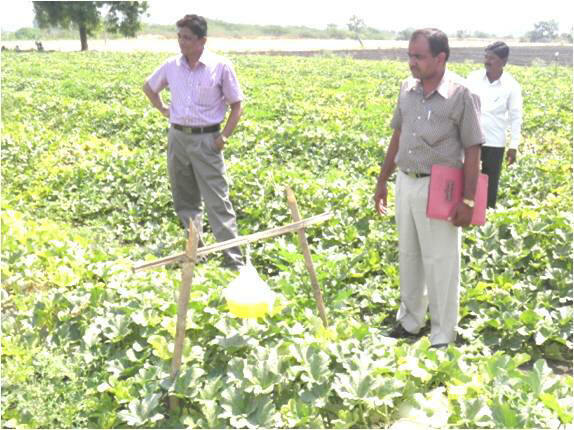 By installing three rakshak traps per acre immediately after fruit setting can effectively manage fruit fly infestation in water melon.Initially KVK undertook the awareness programmes in the form of trainings and group discussion regarding effective management of pests and diseases in water melon and major focus was given towards fruit fly management. The farmers were made aware of rakshak traps as an effective tool for ontrolling fruit flies in water melon. For popularizing this concept among the farmers, the KVK undertook the frontline demonstration on use of rakshak traps against fruit flies at 30 different locations in Ukkalgaon village. The farmers were asked to install 3 rakshak traps per acre after one month of crop growth stage and change the Bacu lure after 30 days. These traps help in mass trapping of male fruit flies and thereby minimize it’s population in the field. The method demonstration on installation of rakshak trap and placing of Bacu lure in this trap was also conducted on the field. The farmers were asked to take daily observations about the catches obtained in these traps up to one week. KVK supported this technology through supply of rakshak traps and Bacu lures from KVK farmer’s service center and thus it helped in spreading of this technology in different parts of the district. Thus the timely and quality supply of this input at reasonable rate has also resulted in increasing the adoption of this technology. With the participation of the farmers the group action took place in Ukkalgaon village for installation of rakshak traps with Bacu lures because there was considerable area under water melon with polythene mulch. The large number of catches of male fruit flies was observed during first 5-6 days and after that the catches were minimized.. This resulted in less egg laying of the pest and thus the incidence of the pest was under check. 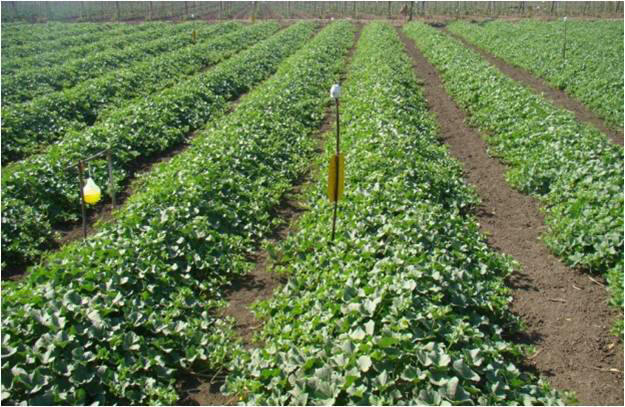 It helped to convince the water melon growers regarding the efficacy of rakshak traps for fruit fly management. The efforts made by KVK in this direction resulted in wide spread adoption of the technology. The technology also spread in the neighboring villages and more number of farmers started to approach KVK for supply of these traps. By observing the effectiveness of rakshak traps, some of the vegetable and fruit growers in the district purchased these traps in bulk quantities from the service center of the KVK and started to use it against fruit flies in cucurbits as well as fruit crops. More than 3000 rakshak traps have been supplied by the KVK through it’s farmer’s service center and the technology has been adopted by more than 200 vegetable and fruit growers in the district covering 325 ha. area during last two years. The concept has now become the regular practice among all the water melon and musk melon growers from the KVK operational areas. By seeing this result, State Agricultural Department also conducted the block demonstration of rakshak traps in water melon on large scale under the funds of ATMA.